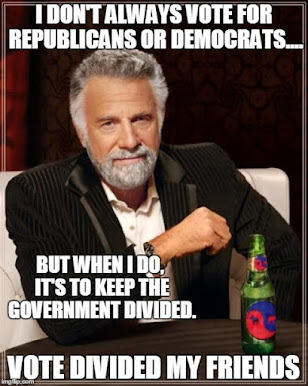 The Dividist Papers: MItch McConnell explains why voting for divided government is always a good idea. 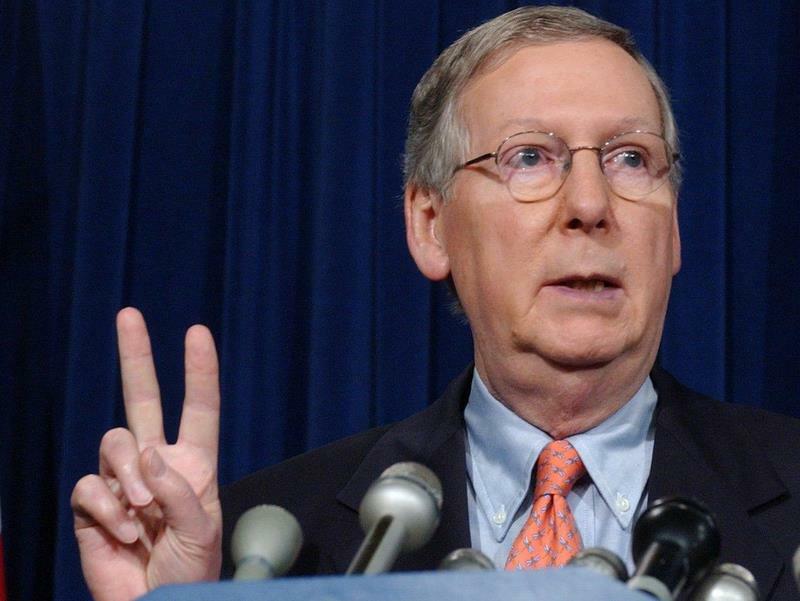 MItch McConnell explains why voting for divided government is always a good idea. MCCONNELL: "The only thing I can tell you at this point is that there are differences. I’m not sure that these kind of differences might not have been there in a more latent form when you had a Republican president. But I do think there is more of a tendency to pull together when the guy in the White House is on your side. So I think some of these views were probably held by some of my members even in the previous administration, but party loyalty tended to mute them. So yeah, I think there are clearly differences and I think a lot of our members, not having a Republican in the White House, feel more free to express their reservations which might have been somewhat muted during the previous administration." This comment is being trumpeted on the left as prima facie evidence of the venal, party-first, hypocritical nature of many congressional Republicans. This is, of course, completely true, as that is indeed their nature. 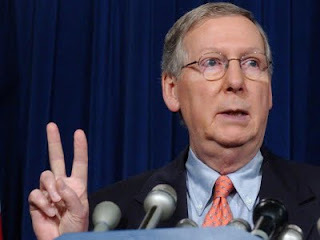 The irony is that the Democrats making that point fail to note that many congressional Democrats are behaving exactly as McConnell notes on exactly the same issue. Democrats are ignoring their principles to support a clearly unsupportable war authority assertion by the Democratic President. They are supporting the President in this claim for no other reason that he is "on the same side" making them equally venal and hypocritical. It seems to the Dividist that this should be painfully obvious to anyone. Except,of course, for the partisans obsessing about the speck in other partisan's eye and not noticing the plank in their own. As the Dividist noted in a previous post, President Obama put us on a path to spend over a billion dollars deploying a carrier attack group, launching air strikes and cruise missile bombardments of military targets in a foreign country. Yet he is making the Orwellian claim that this action does not yet meet the definition of "hostilities" as a rationale for ignoring the War Powers Act. How many Democrats would have supported these actions if it was George W Bush making these claim? Bush/Cheney may have misled the Congress and the country into the Iraq War, but they recognized the legal obligation to secure congressional approval. We now have a President who is asserting that it is completely within his authority to commit our military resources to strikes against another country, and never be required to request the authority of Congress. This is a claim of executive war power far beyond anything that was ever asserted in the Bush/Cheney administration. Regardless of whether you support our actions in Libya, all Americans should be concerned and outraged by this claim. It is nothing less than a subversion of the War Powers Act and the Constitution. Yet many Democrats (not all) are supporting him in this claim. Ann Althouse asks the right question - "...does the need for a check on the President justify the pressure from whichever party happens to be the opposing party?" - but does not take it far enough. 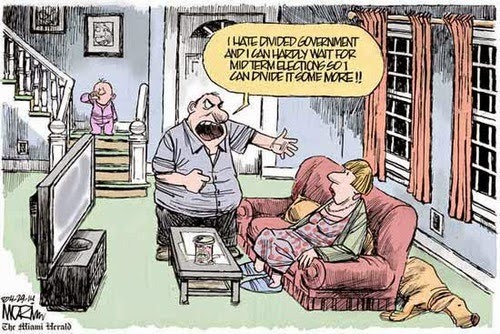 The need for a check on the President and t0 ensure that our constitutional checks and balances function as intended justifies a divided government voting heuristic - always voting to maintain a divided government state at the federal level. Always. Stephen Slivinski and William Niskanen have made the statistical case that we are less likely to become embroiled in extended wars during periods of divided government. Mitch McConnnell simply explained why.